Bismuth is a chemical element (Number 83) that forms a colorful and boxy configuration when it reforms from being melted. 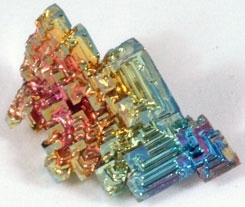 Bismuth crystals typically reflect the colors pink, blue, white, yellow, and others. These colors are caused by oxidation. Bismuth crystal samples are 1"-1-1/2" on their long side. Bismuth crystals are weak metal and care should be taken in handling them. Includes description card. Origin: Europe.